Captain Cook Resorts Ilikai Marina vacation rentals are located at the west end of Waikiki Beach near the Hilton Hawaiian Village and Ilikai hotels. 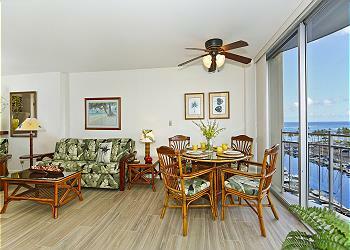 Captain Cook Resorts Ilikai Marina one bedroom vacation rentals have sweeping yacht harbor and ocean views. On Friday nights you can see the fireworks display from your ocean facing lanai. From your Ilikai Marina accommodation it is an easy 5 minutes walk around the Waikiki Yacht Harbor to the swimming beaches of west Waikiki and a 10 minute walk to Ala Moana Beach Park where you will find swimming and surfing beaches as well as community tennis courts. 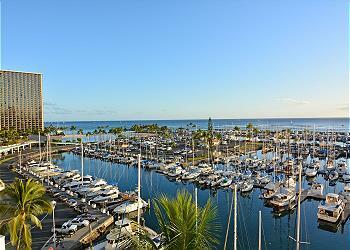 Ala Moana Shopping Center and the newly revitalized areas of Waikiki are close by. 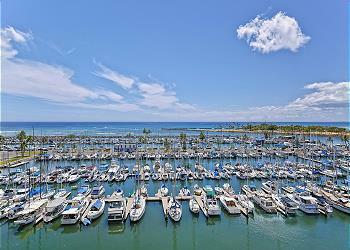 The famous Chart House restaurant is located on site at Ilikai Marina. 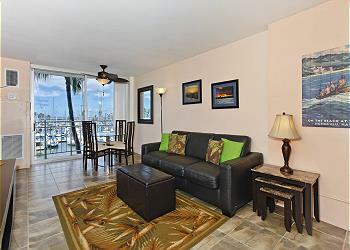 All Captain Cook Resorts Waikiki vacation rental condos at Ilikai Marina are airconditioned, offer full kitchens, and are furnished with linens, dishes and beach towels. 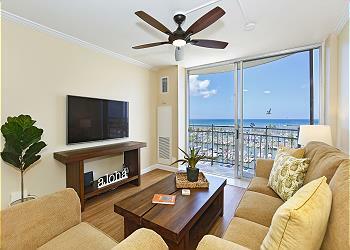 Each condo offers free local calls and high speed internet. Coin operated laundry facilities located in the buiding and on site parking is available for fee. 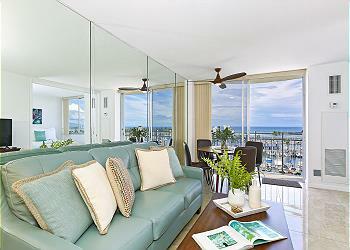 Captain Cook Resorts Vacation Rentals at Ilikai Marina is where to stay if you want to be close to the Ala Moana end of Waikiki with its many fine beaches, restaurants and great shopping. Marina & Ocean views! Easy walk to beach! Sleeps 4. Price per night from $145 to $210 USD Plus taxes and fees. Beautiful sunsets and ocean views and front row seat to Friday Night Fireworks! Newly redecorated 5th floor one-bedroom with AC! Short walk to beaches, shops and restaurants. Parking available for fee. Price per night from $99 to $170 USD Plus taxes and fees. 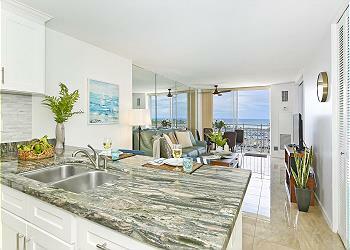 Stylish, remodeled, contemporary furnished studio on 15th floor on marina with kitchen (stainless-steel appliances! ), city/mountain views! AC, WiFi included. Close to everything! Sleeps 2. 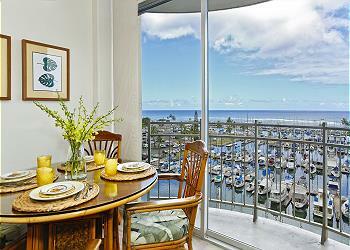 Ocean & Marina views! Walk to beach, shops, restaurants! Sleeps 4. Price per night from $145 to $225 USD Plus taxes and fees. 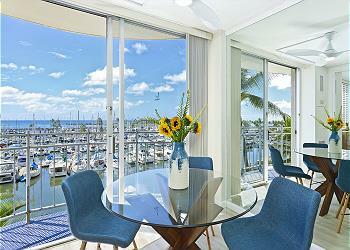 Fabulous sunsets and sweeping views of ocean and marina from this newly renovated 8th floor one-bedroom with AC! 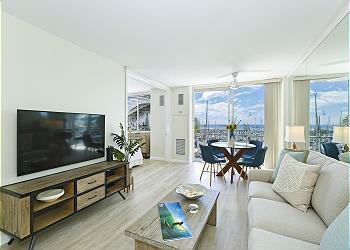 Short walk to beaches, shops and restaurants. Parking available for fee. Price per night from $139 to $190 USD Plus taxes and fees. Updated one-bedroom with full kitchen, AC and views of the marina, ocean, sunsets & Friday night fireworks! Short walk to restaurants, shopping, and beach! Great value; conveniently located! WiFi included! Parking available for fee. Sleeps 3-4. FREE PARKING! YACHT HARBOR VIEWS! 1-bedroom with AC, WiFi, Washlet! 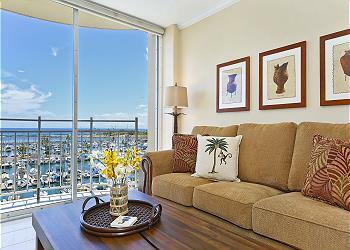 One-bedroom with central AC and views of yacht harbor, ocean and sunsets! Short walk to restaurants, shopping, and beach! Great value; conveniently located! WiFi included! FREE parking for one vehicle! Sleeps 4. Price per night from $145 to $230 USD Plus taxes and fees. Fabulous sunsets and sweeping views of ocean and yacht harbor from this tropically decorated one-bedroom with AC, renovated kitchen, bathroom (with Washlet! ), and free WiFi. Short walk to beaches, shops and restaurants. Parking available for fee. Marina & Ocean views! Walk to beach, shops, restaurants! Sleeps 4. Price per night from $150 to $235 USD Plus taxes and fees. Treat yourself to fabulous 9th floor sunsets and sweeping views of ocean and marina from this renovated, corner 1-bedroom with AC! Short walk to beaches, shops and restaurants. Parking available for fee. 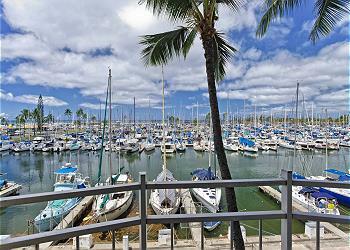 Ocean and Ala Wai Boat Harbor views! Walk to beach, shops and restaurants! Price per night from $150 to $225 USD Plus taxes and fees. Enjoy vibrant 8th floor sunsets and sweeping views of the Pacific Ocean and Ala Wai Boat Harbor from this 1-bedroom with AC! Short walk to beaches, shops and restaurants. Parking available for fee.